Normally when we make a quotation to a customer, our list shop pricing from the system usually includes the local taxes and duties. When a customer checks that price level on the internet he will see lower pricing which gives the impression that our price is too high. Not realizing that transport, taxes, delivery to the boat etc. is included. The customer will draw his conclusion and you will not hear back from him. a separate line for the costs of freight, any import duty or other costs. I found that bench marking the site www.defender.com is working very well for us. A good feature of defender is that they specify the weight of the item so that you can calculate the shipping costs- Fedex/DHL very accurately. You will often find that on the internet for “A” brands the offering of competing companies is about the same level. A big benefit is that the cost of freight, import duties is now separated from the list price. Customer will realize that he has those same costs when he is ordering via the Internet. Often he is totally not aware of the height of added costs of getting the order sent to him. For these orders I charge 70% for deposit payment, non-refundable and non-returnable which means more a less prepaid and no risk for our company which is justifying the lower percentage of profit. Another benefit to highlight for the customer is the warranty. We will honor the manufacturer’s warranty policy and help them in the case of a warranty claim, which can be filed at any of Budget Marine locations throughout the Caribbean. Now we have created a position for our company to add even more value for the customer and I believe that’s an opportunity we as Budget Marine need to explore. Raymarine, Mastervolt, Marinco, Lifeline, Garmin etc. All market leaders and A-brand items. 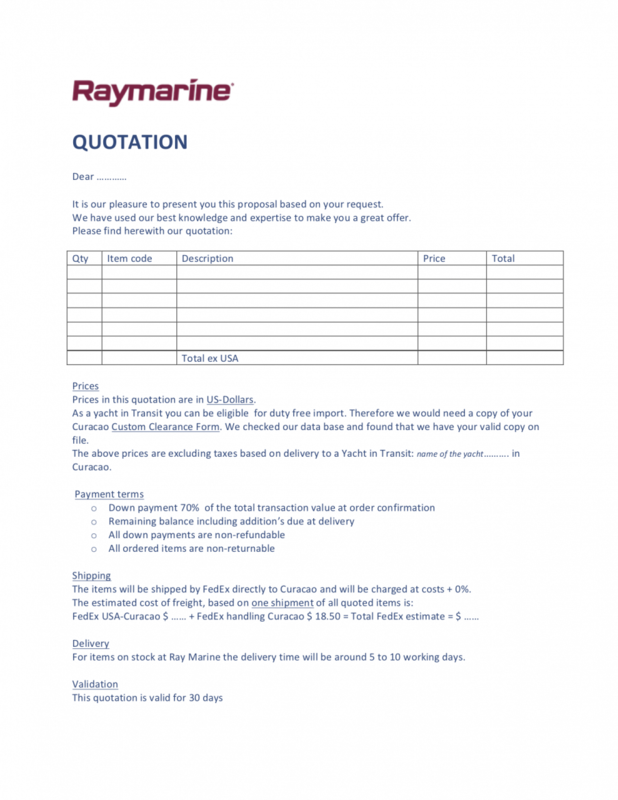 Now Raymarine, a company that has good price level throughout the whole market this way of working started off very well for us. 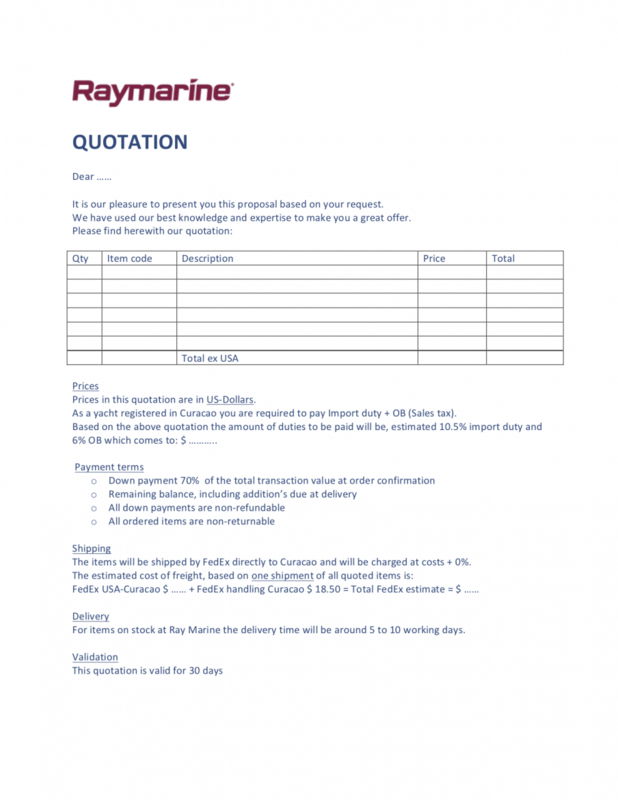 Since doing Raymarine direct we have placed an order every week! About 90% of our quotes are turned around into sales. These are all additional sales as we do not carry the stock! I would definitely recommend all locations to explore this opportunity. 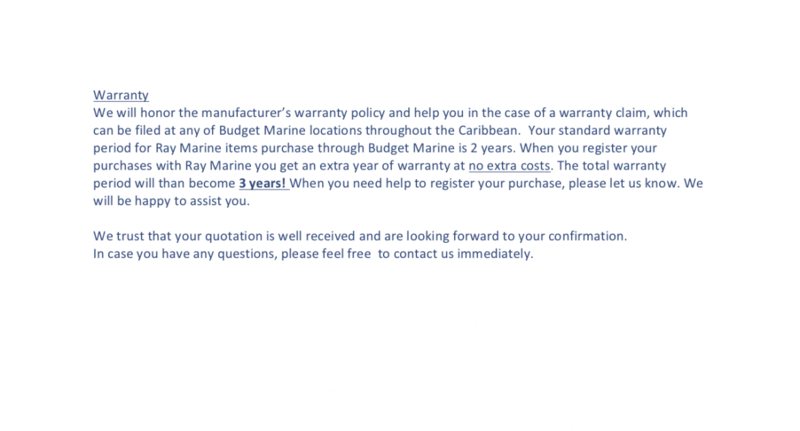 For Ray Marine we try to avoid to mention “just a price” when a customer is asking for it. We always tell him that we will offer him internet competitive pricing. We ask in detail what is the customer interested in and what his expectations are. When it is just a one item quotation we create and present the quotation straight away. Or we will send a detailed quotation that same day. Most request for quotation reach us via the mail, even before we ever met the customer. 1. Normally I copy this template quotation in my E-mail message. If you want you can also add a photo of the item, which I always do when offering a dinghy. 2. In the Excel field you can add the item codes, description and Ray Marine List price: “MRSP”** I copy than from the Ray Marine price list, that I have saved on my desk top. 3. And press SEND or PRINT in case the customer is in the shop waiting for it!